I had to head down to nowheresville, MD for work, so I did a little research (of course), and stopped at Restaurant Sabor for dinner. 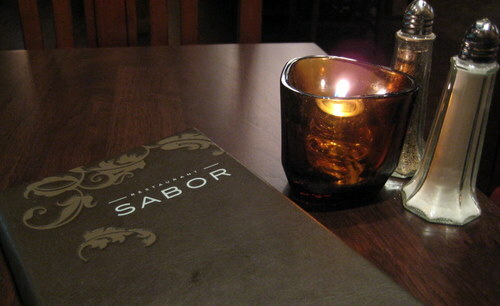 Located in a random strip mall, Sabor boasts a puerto rican chef and a varied menu with latin american and mediterranean flavors. It is a BYOB, and not only does it have an open kitchen (which I love), it also has a community table. It’s a lovely place, a bit on the fancier side, but not snooty. 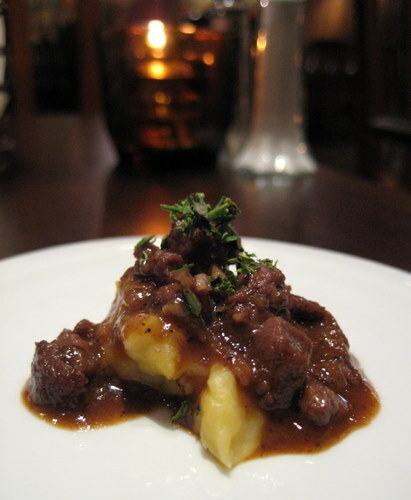 The complimentary amuse bouche of a venison ragout served over a sweet plantain puree. Man, seeing as how good this was, I knew I was in for a great meal. They also give you complimentary bread. Instead of boring regular flour bread, they give you housemade corn bread. And the best part is that they give you whipped honey butter to eat with it. Oh dear lord, there’s nothing better than corn bread slathered with whipped honey butter! I love beets, so I got the beet salad. 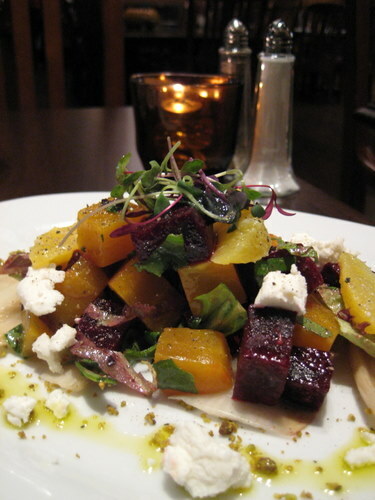 It was hunks of red and golden beets served over grilled chickory, with citrus segments, goat cheese, some greens, and crushed pistachios, in a xerez vinaigrette. This was a lovely salad. The beets were fresh and definitely not from a can! I wasn’t sure if I liked goat cheese, but I soon learned that I don’t like it. It was fine though, I just ate my way around it. I didn’t like the chickory either, so I also left that on the plate. But I fully enjoyed everything else. For my entree, I wasn’t exactly sure what to get. I thought about the fish options but wasn’t convinced. The champagne sauce for the turbot didn’t strike me and neither did the hazelnut dressing on the trout. They also had a daily special of beef bourgignon but I wasn’t convinced about that either. 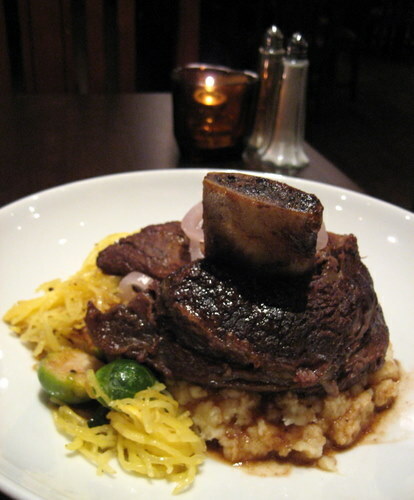 So eventually, I picked the red wine braised beef ribs. This was a ginormous portion of bone in rib. It was super tender and the meat just fell off the bone with very little effort. I liked this a lot, but it wasn’t the greatest. I felt like it could have used a bit more flavor. The rib was served on top of a potato/parsnip puree seasoned with horseradish. The horseradish was pretty much undetectable. It was ok, but I would have preferred plain mash. The parsnip taste didn’t do it for me. There were also some zesty pickled shallots and the seasonal veggies which were grilled spaghetti squash and brussel sprouts. I enjoyed this other veg very much. All in all, it was a good entree, but not great. It was tons of food too, so there was plenty left over. It was also a bit on the pricey side. I wouldn’t have minded if it was a bit less food, and a bit less dollars. I was beyond stuffed to even consider dessert, but that was ok because nothing from the dessert menu really screamed out my name. The service was excellent, for the most part. Up until I got my check, everything was great. After my server gave me my check, he pretty much disappeared. It took him way too long to pick it back up. But that was just a minor glitch in an otherwise lovely dinner. So for those of you in this neighborhood, definitely stop by.